Christmas will be different this year. 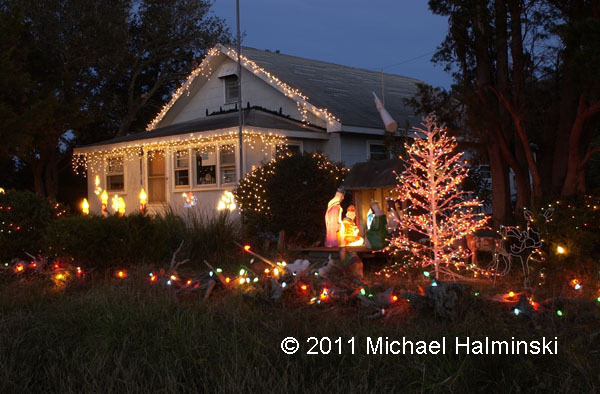 Some of the usual decorated buildings won’t be lit this holiday, four months after Hurricane Irene. 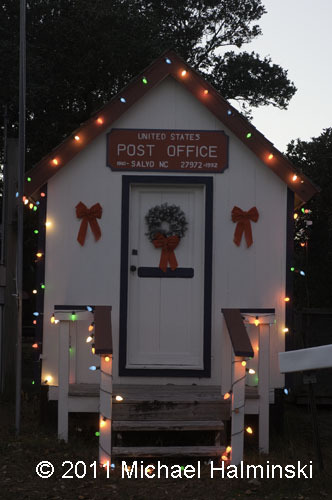 The old Salvo Post Office sits in front of William and Edward Hooper’s house. They are among the elderly of the villages, Edward being the oldest living male at 89. For years they’ve decorated the little building, but not this year. The Hoopers were displaced from their flooded home, and will never live in the family homestead ever again. Another place down the road is decorated to the hilt every Christmas. Janie Hooper has lived in that Salvo house most of her 90 plus years. It too was flooded and sits vacant awaiting it’s fate, still unknown to me at this time. Despite this, we have a lot to be thankful for this holiday. Irene could have been worse than it was. This entry was posted in buildings, Outer Banks, People on December 22, 2011 by j0jgvm89bj.